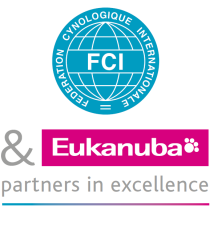 This FCI Asia and the Pacific Section Show was a section show held in Japan for the first time in 6 years since 2008, and a total of 2,459 dogs of 131 breeds was entered. We had entries not only from Japan, but also from Asian countries and European countries for this section show, and they were judged by 14 prestigious judges from Asia, Europe, South America and the United States. In addition, many guests from other Asian countries were invited to attend this section show adding more international flavor, compared to the normal shows in Japan. We also had many visitors apart from exhibitors, demonstrating the high level of interest from the public for the JKC activities. Also, several magazines and TV stations were at the venue to cover the show, which was broadcast in Japan. With the interest of Japanese government being also very high, they have kindly awarded the Prime Minister’s Prize and also the Ministry of Agriculture, Forestry and Fisheries of Japan awarded the Minister’s Prize, as well as the Agricultural Production Bureau Director-General’s Prize respectively. On Saturday March 29th, the first day of the show, the breed competition for the FCI Breed Groups 1, 3, 5, 6, 7, 8 and 10 took place in the morning, and in the afternoon, the Best Of Breed winners of respective breeds competed in the group competition. Moreover, the opening ceremony was held on this date; the organiser made the opening address while the guests from Asian countries were introduced to the spectators. On Sunday March 30th, the second day, the breed competition for the FCI Breed Groups 2, 4 and 9 and the group competition for the respective Best Of Breed winners took place. After that, Mrs Barbara Müller from Switzerland judged the Best In Show competition with the Best In Group winners of both days. As a result, Mrs Müller awarded the Best In Show to the female Siberian Husky “MISANGA JP COFFER” (JKC HU-00870/10). Please find an interview of our Best In Show judge, Mrs Müller, about this section show. Japan is famous for its high quality of dogs, especially in certain breeds. Did the quality meet your expectations? Oh yes. all my colleagues and myself had the honours to judge so many beautiful dogs for different groups and breeds. All dogs were in outstanding conditions and handled to perfection. What point did you put more weight on at the time of your judging in this dog show, appearance or health or others? Of course, every dog has to be healthy and sound. And I was looking for this as I always do. We, judges, should only pick up dogs which are healthy in body and mind. But on the other hand, they should also be nice and conforming to the standard as well. Have you already judged many times in Asia? It has been my first time in Japan and I like to thank the Japan Kennel Club for this honourable invitation. But I have been in other Asian countries before. Can you describe in general the quality of the dogs on this show? As I said before, we saw many beautiful dogs, just to mention some of them; the Welsh Corgies are outstanding, also the Papillons. I have seen beautiful Maltese and Bichons Frisés and, of course, Siberian Huskies. The Terrier Group was quite strong in the ring of honour and also Group 2. It has been a pleasure to judge the Best In Show, but it has not been an easy job. The lineup was just great. Besides the dog show, the JKC Junior Handling Competition 2014 and the JKC Agility Cup 2014 were also organised, while Rescue dogs presented their performance, making a huge appeal to spectators. In addition, a handling lesson for dog owners and a training session for pets were offered to the visitors and, at the same time, many dog-related products were sold at the shopping booths, which were quickly crowded with lots of people buying products for their dogs. Moreover, we set up the booth for Rescue dogs in the venue and raised funds for the disaster victims of the Great East Japan Earthquake which hit Japan 3 years ago. We, the JKC, have been actively conducting such fund-raising activities at various events held throughout Japan ever since. Furthermore, we displayed the winning works of the JKC Dog Picture Contest and the JKC Photo Contest at the venue as well. We are certain that all exhibitors and visitors fully enjoyed this event to the fullest.